Classic Film and TV Café: This Week's Poll: What is your favorite movie about a monk? This Week's Poll: What is your favorite movie about a monk? Last month, we did a poll on films about nuns. So, it only seems fair to focus on monks for this week's poll. Alas, there haven't been as many monk movies, especially when compared to nuns. Still, monks have been played by a wide variety of performers, to include Sean Connery and Charles Boyer. Brother Sun, Sister Moon - Franco Zeffirelli's biography of Francis of Assisi was a big hit with the college crowds of the 1970s, who appreciated its message of hope and Donovan's songs. Cadfael - Derek Jacobi played this 12th century monk who dabbled in solving grisly crimes. There were thirteen 75-minute, made-for-TV films shown in the U.S. on PBS. The mysteries were adapted from Edith Pargeter's popular novels. The Garden of Allah - Charles Boyer stars as a Trappist monk who leaves the monastery and eventually marries Marlene Dietrich! Unfortunately, things don't quite work out for the couple. 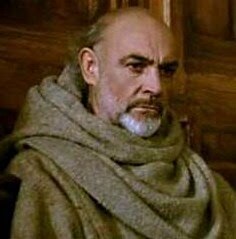 The Name of the Rose - Sean Connery's William of Baskerville was a 14th century monk who, along with his apprentice (Christian Slater), investigated a murder in an abbey. The film was based on Umberto Eco's bestseller. Rasputin and the Empress - The Russian monk Rasputin has been played by many actors, to include Christopher Lee, Tom Baker, and Alan Rickman. 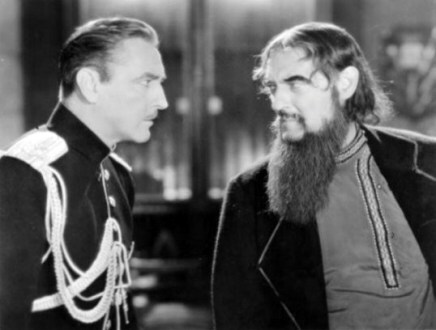 But the most famous portrayal is probably Lionel Barrymore's in the only film that teamed Lionel, John, and Ethel Barrymore. Other movies with monks include Indiana Jones and the Last Crusade, Luther, Francis of Assisi, and the TV-movie Kung Fu. Edward G. Robinson posed as a monk in Brother Orchid. The George Maharis movie The Monk wasn't about a monk, but a private eye named Gus Monk. You can vote for one of the nominees above by visiting the poll in the green sidebar to the right. Rick, you are right to not include Friar Tuck because I think he would have won by a landslide. I really enjoy the very talented Derek Jacobi as Cadfael.